February 17, 1960. 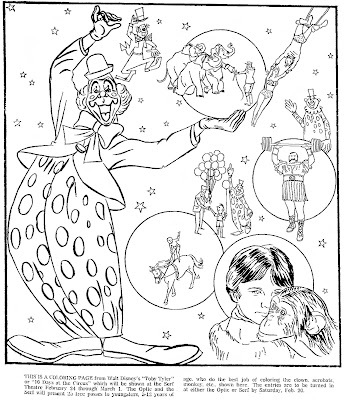 A newspaper coloring contest for the Disney film "Toby Tyler" or "10 Days At The Circus". The movie starred Kevin Corcoran, Henry Calvin, Gene Sheldon, Bob Sweeney, Richard Eastham and James Drury. Directed by Charles Barton. The story is about a young boy that runs away to join the circus.